The newest line of Radwag Mass Comparators allows for calibration of mass standards and weights according to the recommendations of OIML (R-111) from 1mg to 50kg for E1 class and lower from 500kg to 200kg for class M1 and lower. The line comprises 6 types (13 models) each with 5,7 colour touch screen with new intuitive menu. The comparators are used both for ensuring traceability of mass measurements, and verification of weights in accordance with legal metrology. RADWAG Mass Comparators have gained recognition among Accredited Calibration Laboratories, in many countries. Mass comparators series WAY/KO comprise two components. One of them holds the electronic module, and the other precise mechanical measuring system. Such solution guarantees elimination of temperature influence (warming of electronic elements) on the comparator's indications. 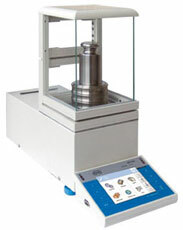 Comparators feature an aesthetic, cylindrically shaped weighing chamber with glass draft shield. All elements of the weighing chamber are manufactured from glass or metal which minimalizes the influence of electrostatic charges on weighing result. Comparator is equipped with user friendly menu. Specially designed software enables management of calibration procedures. The Program is responsible for all stages of calibration processes in a laboratory from the moment of order confirmation up to the final issuing of calibration certificate. After receiving an order, filling all the necessary data of calibrated instruments and assigning an operator, the program prepares mass comparators. Operators use touch panel to communicate with the program and to send all the results of measurements from mass comparators used in that procedure. 2. Additionally program registers ambient conditions in the laboratory and if they are exceeded, it can block measuring instruments. Program has a built-in database of contractors, operators, used standard masses and mass comparators. It also registers incoming orders and issued calibration certificates. In the archive files the program stores all calibration protocols, orders, calibration certificates with the parameters of ambient conditions. Program controls metrological validity of all standard masses used in a laboratory. It performs calibrations according to ABBA or ABA cycles that are defined in the order. Repeatability is expressed as a standard deviation of six ABBA cycles ( according to R111 OIM) in stable laboratory conditions. Antivibration table for laboratory balances Additional LCD display "WD-3/01/Y"
"PW-WIN" computer software Cable RS 232 (scale - Kafka printer) "P0136"
"RAD-KEY" computer software Cable RS 232 (scale - computer) "P0108"
"Computer assistance in calibration process" Cable RS 232 (scale, Epson, Citizen printer) "P0151"